So, a couple weeks ago I was sitting around and I decided that during my Grand Theft Auto V downtime I was going to go back and play some Magic: The Gathering – Duels of the Planeswalkers 2013 on Xbox Live and Magic 2014: Duels of the Planeswalkers(which I finally managed to get installed after two months of issues). This was after getting started in SolForge and getting into the Hearthstone: Heroes of Warcraft Beta. For years I have ignored this as a time/money sink reserved for the meta gaming nerds with more money than common sense. But after a couple weeks of playing the digital version and somewhere along the way seeing that the new Duel Deck had been released I decided to try it out in its physical form and wow, my daughter and I had some serious fun with it. We played 4 rounds with the Duel Decks, each time her Monsters defeated my heroes, but each time was just a little different and they kept getting closer and closer, our last match she only had 1 life left when she finally got me. We enjoyed it so much we ordered the M14 Core Deck Builder’s Set so we could adjust our decks a little bit and maybe build a different color deck or two. These WotC folks may be on to something with this game. Saturday morning we awoke to thunderstorms so no soccer. The girls let us sleep in a bit later than normal but when I went downstairs, Gabby had Summoner Wars: Master Set all set up and ready to roll. Her Jungle Elves vs my Sand Goblins. Took a bit to get rolling but my Sand Goblins eventually cornered her Summoner and managed to take him down, despite some really poor dice luck. After some cleaning around the house to make it presentable for family, we settled in to a long game of Qwirkle in which Gabby won, if we scored this right, she won 315-314. 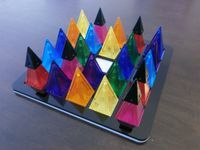 I’m sure we had some illegal placements because after a bit we were just ready to take a break, haha, but all in all we like Qwirkle, this one just seemed to drag on a bit. 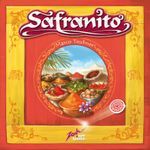 Finally later in the evening I got my wife and BiL to sit down to a game with me and we decided we’d give San Juan a go since I’ve had it forever and there is no reason it should still be on the shelf unplayed. After a brief explanation we started in, about midway through I put down my guild hall and started putting out production plants as soon as I could and that was the difference, I ended up scoring 12 points that way to end up winning the final game on my birthday, 36-32-29. Pretty snappy little card game, one that I think we might break out more often now that we’ve given it a whirl. Really, other than playing Magic 2014 and HearthStone throughout the weekend, that was pretty much it. It was a wonderful way to spend my 41st birthday, just too bad it had to end. Looking forward to getting the extra Magic cards this week and sitting down and trying our hands at building some new decks. Been a struggle to find game time for the past few weekends but I can always guarantee that when my daughter visits we get to restore the balance. Castaways was the game I was probably keenest to try this weekend, as I’m a huge fan of Robinson Crusoe. I think being so familiar with RC steals a little of Castaways’ thunder – but the mechanic by which narrative and plot cards are added to the game is incredibly refreshing. Really enjoyed this, and it will be a toss up as to which game gets washed up on the shore with me first next time. 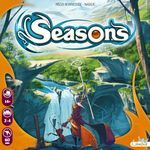 Splendid and smart little filler which plays out in about twenty minutes, as a two-player, and seems like it’s the board game equivalent of Love Letter’s miniature card game. An intense little experience and one that can be grasped very quickly by gamers and non-gamers alike. Great price, too. Third new game this weekend. Huge fan of Forbidden Island and Pandemic, so figured this would be a safe bet. Many people suggest that you don’t need Island if you have Pandemic, but I’ve never agreed – although I was wondering whether the third time was make or break for us. 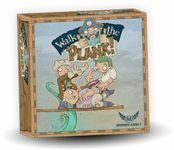 The shifting sand and transforming board mechanic kept us on our toes, and the game feels very different to Island. We liked it, although only just managed to squeak a win on Novice level. Hopefully this is one that my wife will enjoy too (as she really likes Pandemic). Yup: another new acquisition. It feels like we’ve waited for ages for this to come back into print. 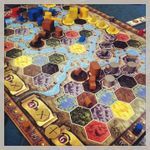 A gorgeous board, as expected, although the game initially seems a little more mechanical than flowing – and we were roundly thrashed on the first legend… twice. Keen to start again, but this one earned an eye-roll from my wife as it’s “another fantasy thing”. My wife doesn’t appreciate this, sadly, (which is making me stall on picking up Trains) but my daughter and I will play this at least once every weekend we can. It was one of the first games we picked up, fifteen months back when I stumbled into the hobby, and I never seem to get enough of it. I rarely win; I just find something quietly hypnotic in getting my engine running. We’re still trying new card synergies and I feel like we have months more of play left in the base set. I’m still enamoured with the deck-building mechanic, but this remains the system at it’s finest. Two games, and two surprisingly easy wins for me, which bucks our recent trend. First play as Jack saw me dancing around the police, whilst I managed a little more mathematical reasoning when I was pounding the beat and managed to box my daughter in on night two. To her credit, she was trying some rather audacious manoeuvres but I guess I’m getting cannier in old age. Bet it doesn’t last. Great gaming weekend. Good to be back on form. This was another week where I manage to sneak in quick games in between activities! Weekend gaming started when my wife Betty and I spend the evening with college buddies Sixto, Dinky, and Dibbs, who brought along their friend Thea. I teach this to Sixto, Dinky, and Thea. Thea ends up winning an abbreviated game by being the first to 3 tokens! Sixto and I had 2, while Dinky just had 1. The gal beats the guys in Love Letter! 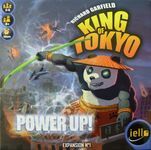 We then play a game of KING OF TOKYO, using the POWER UP expansion. I am the Kraken, Sixto the Alienoid, Dinky used Pandekai, and Thea used MekaDragon. I got the early lead in VPs by rolling well and refusing to yield Tokyo until I was down to 3 HP. managing to reach 14 VPs. Sixto's Alienoid then takes over Tokyo and manages to roll 5 claws to finish me off while bringing the rest close to death. Dinky, however, rolls a lot of hearts and thus drew a lot of evolutions, including one where hearts are treated like the 1 VP result. Thea's Mekadragon tried her best to roll claws in order to enter Tokyo, as she had the Wings card which meant she could avoid damage while in Tokyo by spending energy. Sixto did have the card where Alienoid could heal 1 HP per turn by spending energy, and he used this to maintain his lock in Tokyo, finishing the deal when he rolled 4 2's and thus got 4 VPs which took his score up to 22 and the victory! Pandekai had 15 at that point while MekaDragon had 10. Thea MekaDragon 10 VP, Dinky Pandekai 15 VP. Sixto Alienoid 22 VP, My Kraken KO'd! I managed to squeeze in some afternoon gaming with the Celino brothers Kent and Keith! I teach the brothers how to play this. We used the recommended starting roles, but I decide to put in the expansion buildings. Playing with the Celinos means lots of competition and this proved to be the case as there were LOTS of gunfights in this game, especially in the struggle to get the 3 gun token! I went for early VPs via the money conversion action, and kept up the pressure throughout the game by going for VPs in all rounds. Kent soon follows, and this meant he and I pull away from Keith, who focused more on buying land and earning money. Kent then goes for broke by going for a lot of guns, so much so that he had a +10 bonus by the last round! This, together with extra cowboys due to purchases in the previous round, meant he really pushed me and Keith off the VP actions spaces in the last turn, and thus assures himself of the the best conversion by the end of the game (5 dollars to 1 VP). However, I manage to buy a lot of cheap land around Carson City, and then I built the school which gave me 3 houses, which I built on my parcels of land. This meant that I earned over 50 dollars in the last round and that meant a lot of VPs even at the less efficient 6:1 VP ratio. I also ended up with the most owned properties and this meant I squeeze by Kent and win with a score of 39 to his 37, and Keith was really hurt by his lack of VP gaining actions in the first 2 turns, as he ended up with just 18. The Celinos enjoy themselves a good gunfight. My properties in yellow, Kent's are orange, Keith's are blue. Kent's very early lead in Farmers meant he became a number 1 target to Assassins sent by Keith and I. 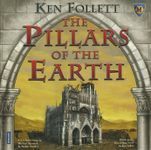 This was a game characterized by my rapid completion of chapters while Keith and Kent went head to head with each other, so much so that I race to an insurmountable lead and win with a score of 22 to Keith's 10 and Kent's 5! We then get to try out my copy for the first time. This game is a simple one where you use pre-programmed instructions (ie 3 cards) in order to push, shove, drag etc. 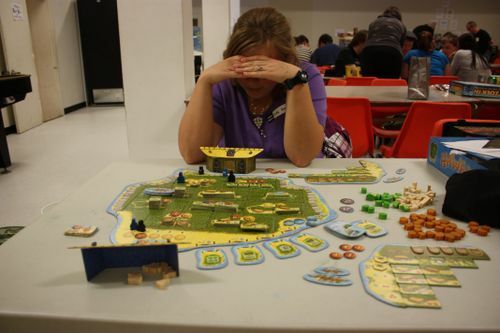 your opponent's meeples off the plank into the maw of the Kraken. We rattle of 3 very quick entertaining games, made especially funnier since sometimes it was our actions which pushed our own pirates off the plank! Game 1: The Celinos focus all their attention to me, and thus I got eliminated early, and Keith finally managed to have the only pirate left for the win as he retracts the plank and dumps Kent's meeple in the deep! Game 2: This time I anticipate their actions and outwit them to be the last pirate to survive! Changing my color to yellow also seemed to help! Game 3: Keith gets eliminated, and it became a tug of war between Kent and I, only to end when my last pirate charges blindly off the plank! This is a hilarious game! This was an efficient afternoon, as we rattle of 5 games in just 2.5 hours! Monday saw me doing guard duty again in the hospital, the day before my mom got discharged. So far, sologames with this have been a breeze. I therefore up the ante and pick the toughest scheme for solo play, which is the Legacy Virus (ie the wound pile has 6 cards, and if these are all gone the heroes lose). There are many ways to gain wounds in Legendary, so this could be a tough one. Magneto is Villain in this one, assisted by the Brotherhood of Evil Mutants plus some Sentinels, and to make things tougher I up him to Tyrant level (+3 HP which makes him an 11 instead of an 8). The heroes opposing him are the X-Men Cyclops and Wolverine, assisted by Spidey. The early game was tough, as scheme twists get pulled out, and in the early phase I did not have the tech heroes (ie grey color) to negate the wounds, so I got 3 wounds relatively quick. 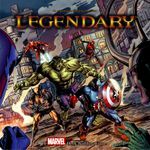 Spidey and Wolverine bore the brunt of the fight early together with the SHIELD grunts, as they complimented each other well with extra card draws. Spiderman rescued a LOT of innocent bystanders in this game, and Wolverine helped KO those useless wound cards out of my deck. Sabretooth and the Blob were constant thorns, but they were defeated often. The deck really started to ramp up once Cyclops joined the team, and finally Magneto himself was getting hit. It still wasn't an easy fight and the heroes were 1 wound away from defeat. The game ended when Magneto retreated from the field together with the Blob (ie the villain deck ran out) which meant that the game ended in a stalemate! And just when the heroes were primed to finally defeat him! Curses! I still count my points even though it was a draw, and I got 59 points (19 from rescued bystanders!) minus 24 for the 8 scheme twists which came out, for a total of 35. Magneto and the Blob escape before the heroes can defeat them! And look at all those bystanders whom Spidey rescued (right). For this delve I use the Mercenary hero, which has the ability to re-roll the dice used to form your party, and once per delve can defeat 2 monster dice of any type. The first delve was a good one, as I reach level 5 and get a potion and an invisibility ring after defeating some goblins and a skeleton. This ins enough for me to level my Mercenary to a Commander (Fighters can defeat 1 more monster, you can re-roll party and dungeon dice once per delve). The second delve was more of the same, as the party reached level 5 again, defeated some oozes and a skeleton, and got a dragon scale and a Talisman (can act as a cleric). The final delve was the most successful, as the party reached level 7 and finally encountered the Dragon! They used the invisibility ring to sneak past it, then escape to surface with their haul of 2 Dragons scales, a potion, a set of Thieves tools, a Vorpal Blade, a Talisman, and a Sceptre of Power! The Commander becomes a Seasoned Explorer, with a final score of 26 points (17 XP 9 treasure (each set of 2 dragon scales gives 2 more XP)). A great final delve for the Seasoned Commander! Shawn and I get to play this, which was just acquired via a trade together with Ascending Empires (I gave up Cosmic Encounter + Cosmic Encounter: Cosmic Incursion). We play at the Normal level, and Shawn draws the Pilot role (very appropriate, as he loves planes! The Pilot can spend 1 action per turn to fly to any tile) and I am the Messenger (I can spend 1 action to give cards to people anywhere on the board instead of having to be in the same tile as them). Shawn and I manage to find 2 of the relics quickly, but then the flood waters came fast and furious, and the island tiles started sinking fast! We had to spend actions to shore up the tiles leading to the last 2 treasures as well as the helipad, since if these sink we lose. The search for the last 2 relics was slower, but we managed to find both as the island was almost gone. The game wasn't over yet, as we had to make our way to the helipad and play the Helicopter Lift card to escape, and we manage to do this with only 6 tiles remaining, and with only 2 more steps before the island completely floods! Success! Look at all the sunken tiles (on the right) as well as the Flood level (above left). I play this while waiting for some takeout food. This time I used the Occultist, who has the power to use Clerics as Mages and vice versa, plus recruit 1 skeleton to be a fighter once per delve. Her scent of death must have been strong, as the Dragon hounded her party throughout all her delves. This meant she could not go deeper than level 5, and that the party expended most of the treasure in warding off the monsters despite the Occultist managing to recruit skeletons. The final score was a measly 15 (Dragon Fodder rank), as the only treasure they got was a potion! Final delve 15 points (14 XP 1 Treasure). The dragon is again defeated at level 5, and the party barely escapes with their lives, but are still Dragon Fodder! Another gaming session at Jim's place. Enrique was earlier and so he picked up the games from me. When I arrived mid-afternoon he and Jim had just finished a game of Smash Up (Jim won) and stopped their second session in order to play a deeper game. This is basically a space 4X game which is much simpler than Eclipse. The twist here is that moving ships involves flicking them across the board, as they are represented by wooden discs! VPs are gained by destroying other ships, by being the first to research colonies, and by mining the planets. Additional VPs by the end game are added for colonized planets and asteroids, for building colonies and cities, and for having cities in 3-4 quadrants. The game was a bit slow as we all grappled with flicking the discs (although Enrique was better at this and thus built an early lead). Things picked up afterwards though and while Enrique solidified his grip on his quadrant I managed to establish a foothold in Jim's quadrant by using my ships to bombard and wipe out his stuff, and also managed to control Jim's expansion into my quadrant. I was ahead in the orange technologies, which meant that I was the first to build a battleship, and this meant that I had the most powerful fleet and I used that to great effect in invading Enrique's territories. Enrique tried in vain by building a lot of fighters but all this did was to feed me VPs as I destroyed them with ease, until he was forced to ram my ships, which also took out his ships. Jim, on the other hand, went for the purple techs (which finally gave him VPs for ramming) and he then went deep into my territory, and finally ended the game when he rammed by battleship to empty the VP pool (a 3 player game has 3 VP chips. If these are gone the game is ended and final scoring takes place). End game map. I am in blue, Enrique in red, Jim is in green. Jim had packed his ships before the pic was taken. The final scores had me with 34 points (17 VP chips Controlled planets/asteroids 8 Cities 6 Cities in 3 quadrants 3), Enrique with 23 (8 VP chips territories 6 Colony 1 Cities 8), and Jim with 21 (11 VP chips territories 5 Colony 1 Cities 4). We made several rules errors in this game, and all of us forgot to use the mine action at all (remove 2 troops to earn 1 VP chip, or 3 troops to earn 2 VP chips)! This was a fun game, and it should be played again! The next session should be faster than the 2 hours we took, as with Mining you can deplete the VP pool faster. This game actually gives me a feel more of being Kemet-like than of Eclipse. I then taught them Village with the Village: Inn expansion, but this was cut short after only 1 round as my wife called and needed my help to treat my dog in the house who got involved in a brawl with our other dog! Some gaming at a coffee shop while waiting for my wife to finish some shopping! For this game Shawn was the Engineer (shore up 2 tiles per attempt), and I was the Navigator (can move and shore up diagonally. This seemed to be a good combo and I was confident we could handle the game, which was set at normal mode. This seemed to be so as the Lion and Chalice artifacts were recovered midgame. However, the game became tight as it seemed that the tiles along the critical pathways kept on getting flooded, and it REALLY took a turn for the worst as Shawn's engineer got cut off from me and could not get to the helipad without a Helicopter Lift card, which we hoped to draw. This was not to be as the tile where we could recover the Red Crystal (the last artifact) sank into the ocean, and thus we lose the game! Shawn and I fail to recover the last artifact, as it sinks beyond our grasp! I then play another solo game using the Tracker/Ranger character, who has the ability to reroll Goblins as well as to discard monsters once per delve. The first delve was ominously difficult as the party had to stop at level 4 after defeating the dragon. This was enough for her to become a Ranger. The last delve had the party go for broke, as they risked everything to go deeper and deeper. At the 7th level there were too many monsters for the party to handle, but they used the dragon bait to summon the dragon (ie all dungeon dice are turned to dragons), and then the party used the invisibility ring to sneak past it to escape with their lives, with just a Sceptre of Power to show for their efforts! The Ranger scores 19 points and is a Village Hero. Guildhall is new to us this month. It has already seen 16 plays this week alone! Everything I had heard about this game indicated that it was confrontational. Therefore I was not certain how the game would go over with my wife, but perhaps the guys would appreciate it. Much to my surprise it has been a big hit with my wife who proclaimed it her new favorite... because she wins. Despite the Assassins and Traders being both of ours least favorite chapters with which we try to avoid using, we continue to find interesting ways to leverage them during the game. I have to say I think for what it is this game is brilliant. It also sets up, plays, and cleans up quickly. At first I was expecting the 20 VP end game condition to take a while, but it arrives awfully quick in some of our games. Quite a few plays thus far have come down to the difference of a turn in deciding the winner. I'd like to see how this one plays with 3-4p. I pulled out Dungeon Roll and played two more characters I hadn't played yet, but admittedly was also a bit distracted so it is quite possible I didnt' leverage their unique abilities to the fullest extent completing each with average scores. Castles was the game of choice Saturday morning over coffee. I had mentioned to my wife we had a few games close to 100 plays and perhaps we could get one of them to that milestone by the end of the year. Castles was not one of them, but it is the one that she chose to be the one we try with... no problem, here. In our first play I finished with no bonus tiles and was one tile short of completing an 8-tile region for a big payout which resulted in a 222/#3 - 156/#2 loss, much to my wife's delight. We refilled our coffee and reset the board. This time I won a closer game 192/#4 - 184/#5 in a very much back and forth play. Of course my wife isn't going to let a split decision sit so we played a third game to determine the winner of the day. This tiem we switched boards since it was relatively close last game. In the end it was another constant changing of first player and taking tiles that the other wanted match with myself emerging as the winner in an even lower scoring faceoff, 167/#5 - 151/#4. After soccer games and my wife's nap, we played two more plays of Guildhall splitting the result with one win apiece. We would have played a third tie-breaker, but we started watching "24" Season 1 and wanted to squeeze in a couple of episodes before calling it a night. Had the chance to play friday only as saturday was busy with family matters. Brass is still one of the best games I've ever played and I get excited every time I have the chance to play it. I prefer the 3 player game as it dilutes a bit more the draw of the cards but still a perfect game with 4. 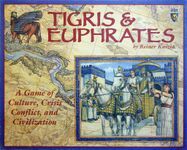 Also played Tigris & Euphrates. Back to the classics. This game really changed in my mind after all these years. I remember when I played it some years ago and it was a brain burner. No I see it more like a 45 minutes almost filler with a great density but easy to get into. Very good game despite its age. Had the full crew of 6 people for the (mostly) weekly game night. Just picked this up recently and got in two plays. These were the first plays for everyone. The game was fun to play and the duration was just right for the game. Some of the players tried to keep track of where every role might be and others just tried to remember what they had. Either way, it worked well. 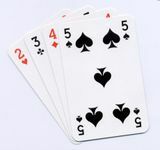 The only complaint was that some of the players thought that their actions were repeatedly dictated by trying to keep the person on their left from winning rather than picking the action to help their position. This was the first play of the game for 3 players and the other three of us had played before. The new players caught on pretty quickly and everyone enjoyed the game. The continual attacks on districts might not appeal to people who don't like "take that" elements but it works well with out group. This game is a lot of fun and I look forward to it hitting the table again. We wanted to finish off the evening with a filler and one of the players left before this game so we played with 5. This was the first play for everyone. It's a complete blind movement and hidden role game with clues as to where the other players might be. It was 3 aliens vs. 2 humans. I was an alien and got killed by another alien on the third or fourth turn. So, I got to watch a hidden movement game for about 20 minutes. Whee. Not really a game I'd play again; it's an interesting idea but seemed to be missing something. Next up we pulled out one of Lindy's games, Elfenland. I had not played in a long time and we both had been desiring to. It was good to play and needs another play soon. Lindy won this one as well. After this we moved on to Seasons, our 25th play together. I was getting more used to the noise by now but still Lindy won. It was time for a smaller game so we filled in with Coloretto. Lindy won again! I was starting to wonder if I should get a complex! To decide starting player on our next game of Hawaii we used Le Boomb since it is not as desirable to be first due to missing out on the 2 fruit. Lindy won again, but this time it was a good thing. It meant I could be second and get that precious fruit. Our 6th game of the day (counting Le Boomb) was Hawaii. It was finally my turn to win. Naturally I had to rub it in a little. I was really pumped that Lindy agreed to Bridgetown Races. I have been trying to get this one back on the table for quite awhile. To show her proper appreciation I whupped her soundly. Well, wait a minute, maybe that was not the correct approach. To decide starting player on our next game of Nexus Ops we once again used Le Boomb. 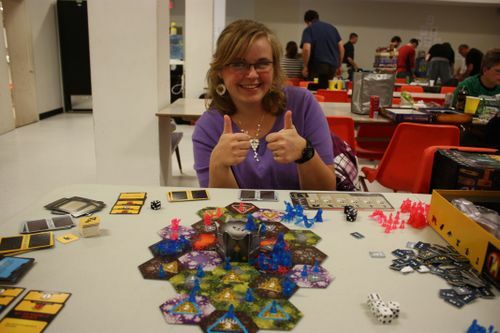 Lindy was as equally pleased for us to play Nexus Ops as I had been about Bridgetown Races. Unfortunately for her she got off to a bad start and I beat her. By now it was approaching midnight and we needed a change of pace. Matt, I think it was, had a huge table set up with PitchCar. It looked interesting to Lindy and I and we needed to get the ol' blood pumping so we went and gave it a try. I won. 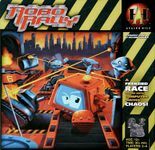 At this point Matt asked us if we would like to join in a n epic game of RoboRally which in the end included 9 players and the use of two game boxes. It was awesome. We had such a blast! Lindy ended up beating us all and getting the third flag long before most of us had our second and some not even their first. Afterward Lindy and I went back to our table for a game of Ricochet Robots. I guess we had not had enough of robots yet. Colin Dearborn (yendi57 here on BGG) and Roxanne, a gamer gal at the event, joined Lindy and I for a game of Nuns on the Run. I was the Abbess and Prioress and Colin, Lindy and Roxanne mostly kept away from me (other than a brief run-in with Colin) until Lindy won at round 10. Lindy and I then taught Colin, Roxanne and Bryce If Wishes Were Fishes. They mostly seemed to enjoy it quite a bit. I won. After this Bryce taught LIndy and I Maori. Roaxanne joined. It is a game I have long been interested in so it was good to play it. Yes, I do like it. However I do not see it on the on-line stores I frequent. I wonder why that is. Lindy and I then proceeded to teach Roxanne Atlantis. She quite liked it and , really, it was just the thing for this point in the gaming night. By this point it was well on to past 3:00 a.m.
Lindy and I were needing another change of pace. Time for some more Pitch Car. Once again I won. NOw it was time for some 10,000. We taught Roxanne who promptly whooped our a**es. Lindy and I had planned all along to play Defenders of the Realm. We decided now was the time. Shortly after starting, however, we had second guesses. I was getting so tired I could hardly keep my eyes open. Finally I went and found a dark corner on the gymnasium stage and crashed on a church pew I found there for about 15 minutes. When I came back we resumed our game. It looked like there was not much hope for us since the red general quickly became lodged only one step from Monarch City. In the end we beat every single general and won. We were amazed! Very tired but amazed. We bumped into Colin at this point and ended up teaching him Undermining. I won. Colin stuck with us as we taught him Lemonade Stand, a fun little card filler. I won. Matt's turn to teach Lindy and I this one with Colin joining in. It was a fun market game of dexterity. Very interesting. Colin won. Lindy and I then taught a fun little card game of stealing called Snitch to Colin, Matt, Kathy and Chad. It was a fun way to almost end the day. Lindy and I fit in one last game - Thebes. Then it was time to drive 2 hours home and have a nap. A few more hours up and then blessed sleep! 24 hours, 24 games played this weekend, 2 of which were starting player games. EDITED to put one out-of-place picture in the proper place. Pluizebol and I played a game of Washington's War. I took an early lead (a big one, at a certain moment it was 9 US to 3 UK colonies) but as the end of the game came nearer, the British came back (even with French assistance) - especially with nasty Line Mutinies in the last turn, making sure I couldn't undo her last-turn work. It all came down to my generals all moving / being recruited to block all the recently-converted spaces or blocking my spaces from being converted - I had a general in Long Island, one in Eastern Connecticut and two in Maryland, just to keep those colonies (or keep them from becoming british). Eventually, a colony count of 7 to 5 won me the game. We also played a game of Scorpion Dishonour vs Lion Switch (Legend of the Five Rings). My lions did very well, a Gohei and Gunjin taking an early Ruined Fortress province (even against refugees) and 2xGunjin + Motso taking another one (after Gohei got Kolat'd). Alas, suspicions + Chrysanthemum Festival + Secrets on the Wind/Force of Will combo's (not to speak of the I Believed in you she didn't even play) meant I got below my starting honour and subsequently also without characters. I played a solo game of No Peace Without Spain! last night - at least, I played 4 turns, and in those 4 turns the Bourbons captured Marlborough and Starhemberg, and the Bourbons flirted with the 0VP automatic victory. By now, the Alliance is doing well again (they are at the French Border by now, are invading Bavaria and Spain), but I don't think it's really winnable anymore - not even taking Liége turn 1 is dramatic for the allies. Went to the BLOC monthly meetup on Saturday, and had a Halloween themed game day. 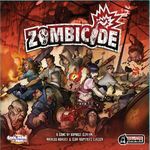 Started off with four of us playing Zombicide. We played one of the missions from Guillotine Game's website called Moving On, where we had to get the 4 objectives and get to the exit. I died early on by missing a zombie with my shotgun, and couldn't run away because of it. I then got swarmed the next turn and just tried to take down as many as I could. The rest of the group got two of the objectives, but were also overwhelmed, and we got eaten. So we set up another tile, this time the Zombie Police mission from the rulebook. In this one, we had to get an objective which let us open a specific door which had behind another objective which let us open the door into the bunker, which was our goal. Thanks to Wanda's speedy movement, we were able to get the objectives pretty quickly before the zombie level went up too far, which kept everything at a manageable pace. Wanda sacrificed her life opening up the bunker for us, and the rest of us made it inside. After that, two more people joined us for a game of Betrayal At House on the Hill. We explored the house quite a bit and had a lot of rooms opened up when the haunt started. This haunt did not have a specific betrayor, but a hidden one. Someone had an alien virus. We all drew two different numbered tokens. Whoever had the 1 had the virus. His goal was to infect the others, or kill them. Every time two people crossed paths, those two people would take a token from each other at random. If the 1 token was passed, than that person also became infected. The non-infected players had to use the lab and make a serum in order to prevent from becoming infected and win. If the infected players won, then the last player to become infected would lose (to prevent people from just becoming infected for an easy win). We had all the stuff we needed to make the serum, but two players had died (there was also a 'timer' where an attack would occur on everyone, to prevent the game from going on forever). Neither dead player had been infected, and everyone else was around the lab, spreading the virus back and forth. It turned out the rest of us eventually became infected, so the traitors won. Except for me, because of course, I was the last one to be infected. There was time for one more game after that, so I joined two others for a game of Pandemic, where we cured 3 of the 4 viruses, before our location deck ran out of cards and it was over. 2 practice rounds for the month 2 organized play event. Two games, one to teach the wife (which she won!) and a second now that she understood what was going on. 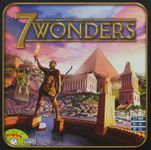 Isn't this how every new player to 7 Wonders goes? Halfway through the game a light bulb turns on and they want to try again. Hopefully she'll be playing more often when friends are over. 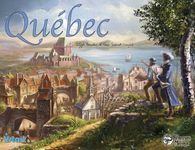 I've owned Quebec for a while. I took off the shrink and broke it out. It's a pretty good game that I'd like to play some more. This is the third week in a row I've played Troyes. 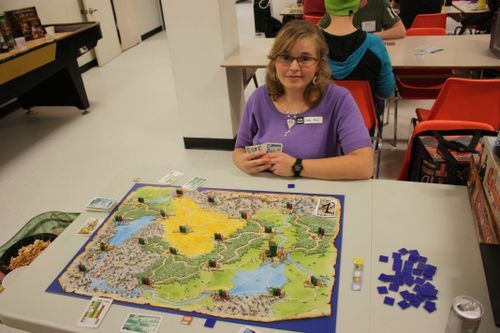 I taught it to two others who had never played, and they really enjoyed the game. I introduced Firenze to three new players. I don't think it was as well received as it was the only other time I played it, but I still enjoyed the game. I got 1 play of Tikal in with my wife. This was our first time with the game, and it really impressed me to no end. 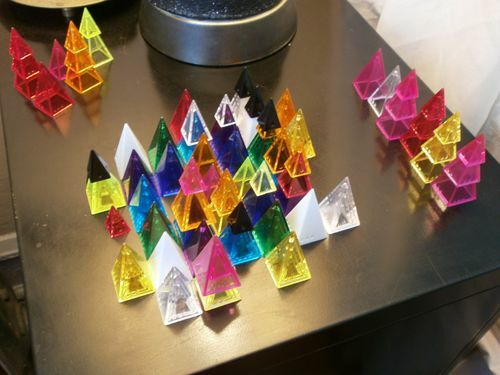 I just wish the levels of the temple were plastic, so they'd look really cool. We also got our first play of Yedo using the samurai cards. We got lucky and didn't see too many of them come up, but it definitely made us use the 'look at next 3 events' a lot more, which I thought helped the game overall. Troyes - Finally got this to the table this weekend. I played 2 two player games with my wife. This game really is excellent. The theme... Meh, I admit it, the theme is pasted on and the art is not going to be for everyone. I would disagree with anyone who would call this soulless, though. The soul of this game is in the decisions. Really liked this one (obviously). 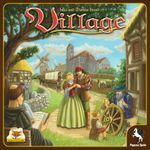 Village - Another game we finally got to the table. I hate to say it, but this one did feel empty to me. I was so sure I would enjoy this. I watched Rahdo's Run Through of it, I watched Shut Up & Sit Down's review, it won Kennerspiel, it has that cool death mechanic... I was just bored playing it. We're not giving up on it. We're going to play it again and try to be a little more active in telling our family stories as we go. I know the theme is there, but it just didn't come across all that well in our first play. And minus the theme, the mechanics and decisions just weren't that interesting to us. I'm really hoping to see something I missed. We'll see how it goes. 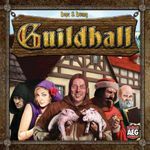 Guildhall - We got in a couple of two player games of this as a warm up before diving in to Village and Troyes. Really like this set collection game. I have the expansion, but we still haven't even cracked it yet, because we've been enjoying the base just fine. 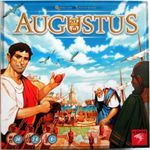 Rise of Augustus - We bought this game specifically because we thought it was a game we would enjoy with my family... Then we played it 18 times last month, none of which were with my family. We finally got to play it with them last night and as soon as we finished the first game, we played it two more times. It's light simple fun, it plays fast, it was a big hit. This was as special weekend @ InvictaCon. Had a chance to play with new and old friends with whom i haven't played in a long time. And ended the evening playing a friends prototype not yet on BGG database. Black Spy is a variant of Hearts. Problem is, it's not enough of a variant of Hearts. I'll have a review up of it soon. I pulled out a win. Bruges followed. I tried a canal strategy after getting the Geographer card early on, building off both ends of my city. My last play would have completed both ends, except the preceding player hit me with a third army threat, which depleted all my funds and meant I could not complete the last portion of the second canal. Stink. It did not matter, as the third player beat us. The Palaces of Carrara felt like a mashup of Suburbia, Alhambra, the valuation aspect of Power Grid, and any Eurogame with a rondel-like mechanism. The player who had played it before crushed the other player and me. Crushed. Bruges had been closer, but I actually preferred Palaces of Carrara. This is not to say that I did not like Bruges or Palaces of Carrara or that they were not good games. I would readily play both again, as I thought both had that elegance that shows in a well-designed game. 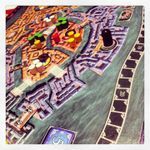 While I liked the valuation wheel on Palaces, I kept wondering what it was about Bruges and Palaces that set them apart from any other games out there, and I wasn't sure anything came to mind. 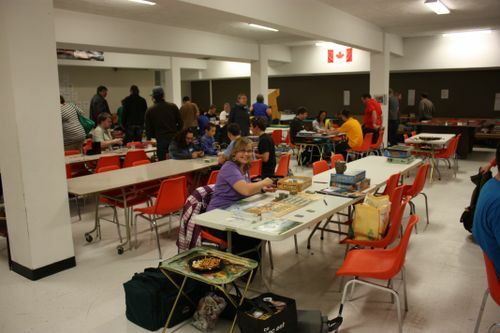 Makes me wonder if this rapid expansion in the board gaming hobby is at its bubble stage. Sneaked in a late-evening game of Call of Cthulhu: The Card Game after church. It was a very close game, in which my critical error was retrospectively obvious. Despite the loss, Vaage Randers emerged as a star of my deck Steal This Book (Miskatonic/Syndicate, natch). Played my new 8-color variant of Caldera with my daughter in the morning. It's a little better than the original, I think. In a lunchtime game of Hive, she was really not paying attention, and just gave me the win. Later in the afternoon, we played Survive: Escape from Atlantis. It was our first game with the Giant Squid expansion, which works great and seems almost necessary with two players. It might be cluttering and unnecessary at higher player counts, though. My girl managed to get a whale to smash the boat containing my last remaining evacuee, but he was right next to a refuge island, so he just moved there on the next (and final) turn. For the last game of the day, we had another go at Chupacabra: Survive the Night. 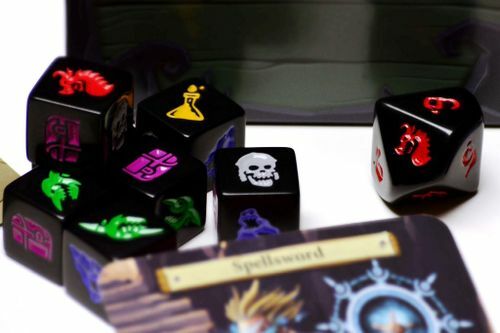 We tried to make 2-player more interesting by starting each player with 12 dice instead of 6. It made it faster, anyhow. We played a game of my newest Caldera variant: the 7 x 7 Supercalifragilisticaldera. It was great. The game was longer, but very competitive, and my daughter won. 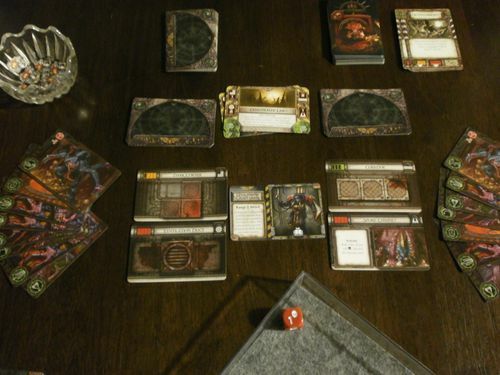 In the evening, I had a couple of solo goes at Space Hulk: Death Angel – The Card Game. I'm improving, but I've still got a ways until I'm good enough to win, unless I get ridiculously lucky. The weekend turned out to be the first time I had a chance to play anything. Love Letter got a couple plays. My wife and I played and the game was pretty tight down to the last round. My Saturday game day with my brother also included a game of this. My brother drove up for an afternoon of gaming that ended with Love Letter (above). 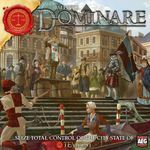 We decided to try a variety of game types as last time we did a couple of tile-laying games. We started out with a couple games of Pandemic. The first intro game went fairly well but ended with us barely winning as the end of my turn left us with no black disease cubes and several cities with 3 cubes and only 2 outbreaks to go. But we managed. Then we took on a regular game and also had a near loss but some smart planning for placing a research station allowed us to squeak in a win. Mr. Jack in New York was up after lunch as my brother had wanted to play Electronic Detective but didn't have the right batteries. We played two games of this switching sides and both were pretty fun. Our final game of the day, before dinner, was Jump Gate. 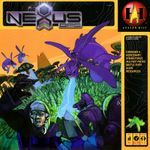 My wife does not like sci-fi themed games so this is one that sort of languishes in the game closet. As of yesterday, I think I was the only player yet for October. 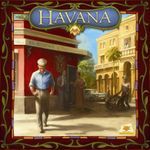 This is a resource collection game with great art and components that is again not too difficult to pick up and play. There was a family game day that I was invited to come to since people knew we had lots of games to play. I brought several, but there were few older adults around to play. 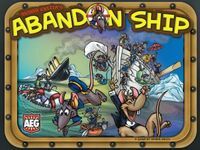 That said, I taught and played Abandon Ship to a group of elementary school kids who had a great time playing this little Knizia game. As my wife had missed out, we decided to play a couple games with the 2 of us later that night. Having piqued people's interest by setting out Survive: Escape from Atlantis! 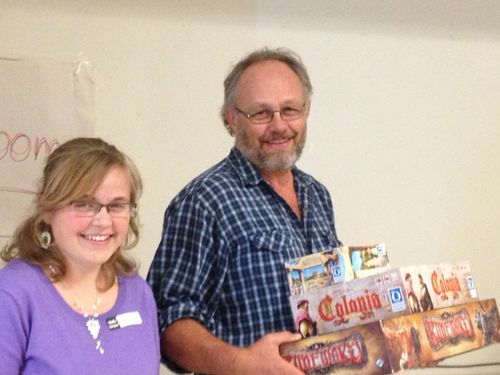 I then played and taught a game to a family who enjoyed playing with their otherwise moody teenage daughter. She ended up tying for the win. Somehow we ended up not finding the volcano until the very last tile. An interesting game weekend that still left several new Felds I wanted to play but couldn't get to the table so hopefully that will change in the coming week. But it was still a pretty great weekend. An eleven hour game of Pursuit of Glory. I played the allies and did well until I got to Total Wasr. Then I realized some of the mistakes I had made. I had stopped raising the War status not realizing there were cards in Total War that required the status to be higher. This caused some huge problems. That coupled with back to back mandatory offesives that required no British offensives just when I had conquered Eygpt, taken Jeruslem and was pushing North. The Russian were also doing a good job pushing west when the revoltion started and that was the beginning of the end. This was only my second time playing and the first as the allies so I learned a lot. 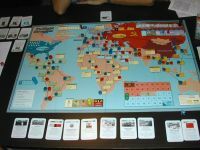 Not raising the war status was probably my biggest mistake as I could not play a few pivotal cards. As with all CDG's knowing the cards is a HUGE advantage. In the end the Allies surrendered with the collapse of Russia. Nice light and quick role selection type of game. Since this was my first play of it, I got creamed as I was one round behind or people were picking things I wanted during the same turn but were able to go before me. I can see playing this again. I would rank it roughly a 6.5 maybe 7. I taught a couple people this game, and it went really slow even as a first time playing game. I didn't want to make it a full blown teaching game and offer strategy advice, but it was really close to that kind of feel. In the end I lost by around 4 population. I had figured out how the public scoring was going to go, and I knew I had my secret goal in hand so I played out my turns based on that info only to check again towards the end and see scoring for the public goals had changed so the person in the lead was getting an extra goal. I doubt I could have altered the final scoring, but it would have been nice to at least try. My Mom came over the next day and asked why I had left a bag of games outside as they were wet. I left the bag there when I opened the door and forgot to go back and get the bag. I figured any moisture was due to the morning dew, but I picked up the bag to be reminded of the storm we had the night before. Oops. Due to my OCD nature with board games, all game pieces were bagged or put in Planos so those were fine. All of the game boards had the most minor amounts of water damage to them. I think I could put down all of the game pieces and nobody would know they went through a storm. The actual game boxes well...FYI, the bag in question was an over stuffed duffel bag so there was little protection since the top was open. Race for the Galaxy - A three player game, with the Gathering Storm expansion. It was a quick game that I won with a rare production / x2 combo once I got it working. The final result: 60 points for me, 24 for the second place. Bridge Troll - A five player game, not the best count of players (I much prefer with 4, and with 3 is also good), because with 5 the game ends rather fast and there isn't much chance to do really start and develop something to turn into points. Being the only one not learning the game, I had the advantage of knowing the game flow and, with this, I won a photo-finish game: 29, to 28, to 27, for the first three. Haggis - A three player game, and also my debut with it. We only played two full rounds, to see how the game goes and learn the rules better. We all liked the game, a good escalation game, and I ended up in last after the two rounds. 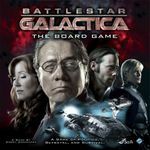 Battlestar Galactica: The Board Game - A five players game. An awesome game, in wich the humans started pretty well, going without a hiccup. The crisis were dealt and no cylon attack happened after one that came in the second or third crisis. When the sleeper phase came to be, all the resources were in blue, so I has hoping to not become a cylon - and I didn't. The cylons revealed themselves in the first opportunity, but the next jump gots the humans at the 8 distance. Just one more jump. But then things crumbled. 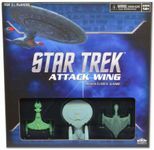 All the crisis with the jump advance disappeared, and two cylons attacks came - one that made the FTL return one spot. Galactica was surrounded by two basestars, three heavy raiders and all, yes, all raiders - and only 4 vipers were defending 5 civilian ships. Population was dropping severely and we couldn't lose those civilian ships before the jump. An attack of the basestar destroyed the FTL room. So Laura Roslin had to leave Colonial One and fixed it. But the FTL didn't advance fast enough, and the cylons had a chance to activate the raiders two times, but the first cylon player choose to send one crisis, a mistake in my view. The next one activate the raiders, that destroyed the vipers, but the civilian ships weren't attacked. Then Adama send one scout and see a card that would advance the FTL to the -3 spot. The basestar attacked again, and we hoped that the FTL room would not be hitted again, and it wasn't! So, when my turn came, Laura Roslin gave the order for the jump and the humans won! Galactica had 4 ou 5 damages, and the resources were: Moral - 5, Food - 4, Fuel - 3, Population: 1. 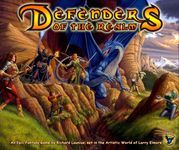 Defenders of the Realm - A two-player game: we’ve lost (again) due to the tainting of the land. Love Letter - A six-player game: we used some kind of home-made version. It was a blast, as usual with this game. Zooloretto - A five-player game: I was almost forced to play it and played very badly, without even trying to optimize my actions, and yet I scored second with 21 points (the carefully planned zoo of the winner gained him 27). What a poor excuse of a game. Arkham Horror - A seven-player game at small local convention: after four good hours we were still light years away from the end and broke off. Picked this up a few months ago as my wife was a huge fan of the book and after I showed it to her on a youtube review was willing to give it a try. Finally got it to the table Saturday night. It's a beautiful game. 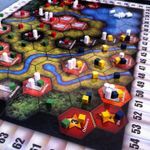 The worker placement mechanism was new to my wife, so the repeated flow of the rounds was really helpful within a learning game. 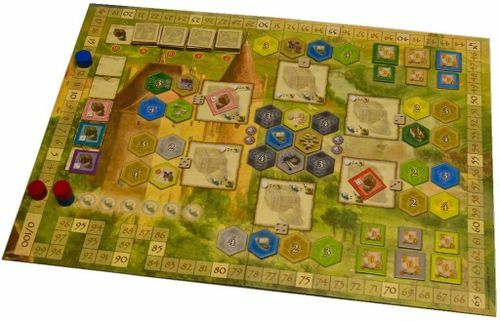 It feels pretty open as a two player game, I can see how adding just one more player would certainly increase the competition for resources/craftsman significantly. We enjoyed the game, so I expect it'll enter our gaming rotation. I also did a solo learning game of Lancaster, which I hope to get to the table for a multiple player session sometime in the next month. This one has a lot of promise for my gaming group. We like high interaction and finding that in a shorter game could make this a real find.